In 2004, De Balie in Amsterdam hosted a festival and symposium oddly entitled ‘An archeology of imaginary media’. I recall fascinating lectures by Siegfried Zielinski, Bruce Sterling, Klaus Theweleit, Erkki Huhtamo, John Akomfrah and Timothy Druckrey, chaired by Balie staff member and media theorist, Eric Kluitenberg. Now we have the book of the symposium containing meticulously revised versions of the original lectures, augmented with a few additional texts and a dvd featuring other contributions to the festival. The symposium title seemed to suggest that imaginary media existed primarily in the past – how else could it be subjected to archeological study? – but the book attempts to demonstrate the topicality of such media. And this is where the difficulties begin, because what are imaginary media? 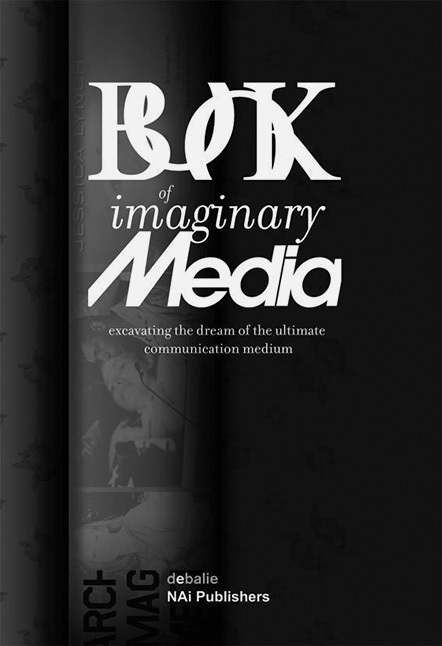 The book’s subtitle – Excavating the Dream of the Ultimate Communication Medium – implies that imaginary media are always of a science-fictional nature, fantasies about what media could achieve if only technology were able to keep pace with our powers of imagination. But oddly enough, there is little evidence of such fantasies in the book. What the absorbing contributions by Zielinski, Sterling and Huhtamo (Theweleit is for some reason absent) do discuss are all manner of marvellous devices which may or may not have existed in fact and which have now been so definitively overtaken by technological developments as to be barely conceivable. Examples are the incredibly complex arcae musurgicae invented by Athanasius Kircher in 1650, a composition box for composing every conceivable kind of music, Thaddeus Cahill’s teleharmonium of 1907, which could be used to send electronic music to restaurants over the phone, and countless ‘peep media’ from previous centuries which allowed people to peer at educational, funny or obscene objects and pictures through a hole in the wall of a closed space. These contributions exemplify Kluitenberg’s remark in the introduction that the book is about understanding ‘how imaginary qualities of media affect their actual course of development’. In the three mentioned essays, which make up half the book, the authors show how the potential of certain media are recognized before they can be realized or before a socially useful function for them has been discovered. The composition box looks ahead to the sampler, the telharmonium to muzak and peep media to the most universal peepshow of all, the tv and its successor, the webcam. Kluitenberg argues in his introduction that the aim of the essays is ‘to retain a certain utopian potential of communications media, without stepping into the pitfalls of overly eager media imaginations, or the cynical political or economic agendas’. One example of such overly eager media imaginations combined with nefarious economic plans is the Internet bubble of the 1990s: when it burst in 2000, faith in the utopian potential of the Internet took quite a knock. Halfway through the book, Kluitenberg himself takes a closer look at the often irrational motives behind media inventions like those of Thomas Edison and Nikola Tesla. While the first dreamt of being able to converse with the dead, the second hoped to be able to transmit electric current without wires. Kluitenberg proceeds to link this constructive nonsense with Roland Barthes’ concept of myth. ‘Myths are signs whose original meaning has been erased and onto which new second order significations have been superimposed.’ This Barthesian concept of myth proves to be fatal for Kluitenberg’s imaginary media idea. The opposite of imaginary, according to Kluitenberg, is real; Barthes’ mythical second order of meaning is imaginary while the underneath, first order is real; conclusion: the role of imaginary media is to conceal the true ‘strategic concerns behind the eternal myth of new technology’. Alas, alas. If that were so, this book would not be interesting, because it would only be about the flimflam used to disguise ruthless economic and political games by means of the media, while the inventors and the majority of users are under the illusion that they have finally acquired the machine ‘that can transcend the limitations of the merely human’, as Kluitenberg writes. If Kluitenberg had used Ernst Cassirer’s epistemological concept of myth instead of Barthes’ ideological one, his book would once again be interesting. According to Cassirer, we human beings have multiple, equivalent methods at our disposal for acquiring knowledge about the outside world and ourselves – the mythical is just one of them. The opposition between imaginary and real is false because something can only be real for us when it is also imaginary, when it stimulates our imagination and inspires us to new ideas and applications. Something that is merely real is banal, uninteresting, uninformative. Everything that lives for us is both real and mythical. Even the human condition, which according to Kluitenberg cannot be compensated by technology, is just as mythical as technology itself – both are cognitive and emotional constructs for making the world and our place in it manageable, in the sense of accessible and intelligible. If Kluitenberg had taken his own concept of imaginary media seriously, he would not have been so discombobulated by the dotcom crash and would not have asked: ‘Why did so many people by-pass all sound judgement, and how was this unprecedented destruction of financial and human capital possible in the first place?’ Our judgement only remains sound by going along with the desire that the world transcend our sound judgement. The same critical attitude that undermines Kluitenberg, also weakens the (new) contribution of Richard Barbrook. During the 1964 World’s Fair, according to Barbrook, IBM pretended that the computer was about creating artificial intelligence in order to distract visitors ‘from discovering the original motivation for developing IBM’s mainframes: killing millions of people’. Computers were indeed used, among other things, for calculating the trajectory of nuclear missiles. Yet it is also possible to assert the opposite – that the computer’s military applications were a screen behind which IBM concealed the true potential of the computer in order to con the military into paying for its development. These ‘true’, utopian, objectives were a higher human intelligence and the exploration of the universe with a view to giving human life more room to manoeuvre. After all, those nuclear missiles were never going to be launched because they were not intended to knock out the enemy, merely to keep him from using his own weapons (and vice versa). The military uses of the computer were just as imaginary and mythical as the civilian ones. Despite these criticisms, I regard the Book of Imaginary Media as a welcome addition to media theory and media archaeology. It stimulates thought and imagination in a way that I have not found anywhere else. That is because it focuses attention on an aspect of the media that makes them on the one hand so irresistibly interesting, and on the other hand so hopelessly inadequate. We want more from our media than they are able to offer and at the same time our imaginations repeatedly fail to truly grasp what media are capable of beyond mere communication.